MONSTERS AND MEN premiered at Sundance and won the Special Jury Award for Outstanding First Feature and screened at the 2018 Toronto International Film Festival. Altitude Film Distribution have partnered with platinum selling artist Drake to jointly release the film in the UK & Ireland. 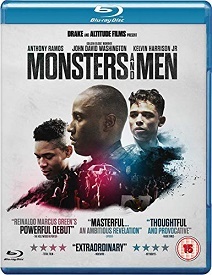 Shot in Brooklyn, NY, Monsters And Men features John David Washington (BlacKkKlansman, Ballers), up-and-coming actor Kelvin Harrison Jr. (Mudbound, It Comes At Night, The Wolf Hour) and star of Broadway’s Hamilton Anthony Ramos.